The lease of a property in East Street in 1787 (see the Virtual Museum, 1780s submenu) describes the premises as 'ruinous and in great decay..' A condition of the lease is that William Fabyan must 'rebuild and repair' the premises, 'lately burnt down'. Left: Fire insurance plaque at 9 East Street. Until at least the 1600s, people were reliant upon the charity of others if they suffered the misfortune of losing their homes and contents in a fire - typically the church would make a collection. But then someone had the idea of insurance, and a large number of companies were formed to provide compensation. In a time when properties were not numbered, a 'fire mark' was fixed to buildings to show that they were insured. 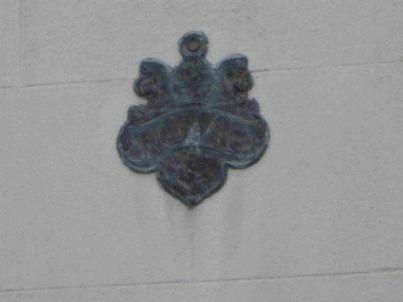 The plaque, or mark, shown above appears to be that of the Royal Insurance Company (1845 - 1997) - the word Royal in a broad banner can just be seen when the photo is enlarged. Above and right: A 'Policy of Assurance', No. 995797, from the Phoenix Assurance Company in 1850. 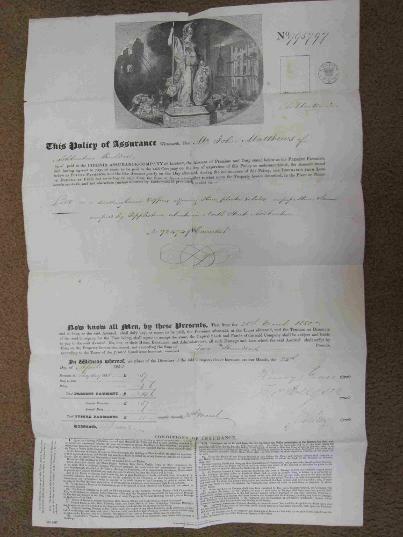 The policy, for insurance from loss or damage by fire, .was taken out by Mr John Matthews, Builder, of Ashburton, for a dwelling house and adjoining office. The house, in North Street, was occupied by Popplestone. The sum assured was £200, and the annual premium was 5s plus 6s duty, payable on Lady Day. In 1843 a fire broke out in Mr Headon's candle manufactory, behind Crispin's Inn and adjoining the Arch. Stables and other buildings belonging to the inn were completely destroyed. 1848 Mr Perrott, saddler, suffered a fire in his shop in North Street in July. 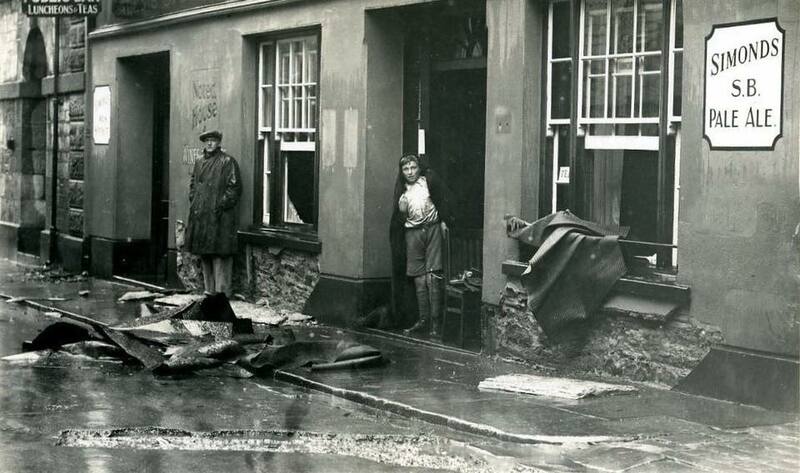 The contents were destroyed, as was part of the contents of the newsagents' shop to the right, occupied by Mr Mann. Mr Mann had been the first to raise the alarm, after seeing the flames reflected in the windows of buildings across the street. 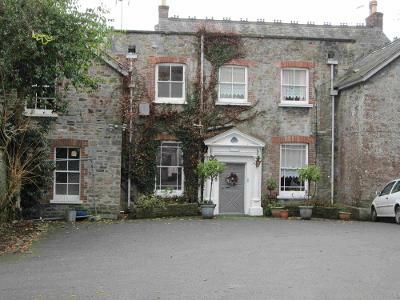 The house of John Roaden, relieving officer, adjoined Mr Perrott's on the left hand side. Later the same year a fire, believed to have started from a spark from a candle, destroyed much of R Caunter's Belford Mill. 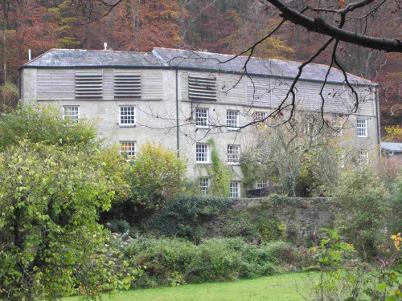 Everything in the mill, including all the machinery was lost, but the 'immense' water wheel and adjoining living accommodation was saved. The mill, four stories high, was built, according to the Exeter and Plymouth Gazette, in 1825. It started with a chimney fire in a thatched property in Back Lane (now Stapledon Lane), and messengers were sent to ring the fire bell at the Market. 'The rope of the bell was broken and it could not be rung'. One of the two parish engines arrived, but could get little water from a nearby pump - the workers were hindered by not being able to get fire ladders or fire crooks. The second engine arrived and had better success with getting water - meanwhile the elderly occupants of the house had escaped, and their furniture removed. Later more engines were sent for from Newton Abbot (Robert Rendell and men) and Buckfastleigh (C Furneaux and men). The fire then spread next door to a property belonging to Mr Robert Bowden, and then to a barn and dwelling of W F Down, tea dealer; then to the property of Mr Norrish, dairyman. Cider, fish and wood was destroyed. Soon an old thatched slaughter-house on the opposite side of the lane was ablaze. The report stated that 'the old chapel and adjoining houses were saved'. 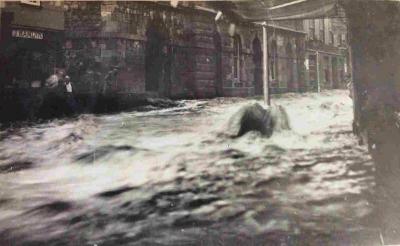 Water was now being pumped from the River Yeo (now called the Ashburn), and water was also released from the Roborough reservoir, to run down East St. The locks had to be broken off the reservoir because the keys could not be found - afterwards a recommendation was made that people should know where the keys to the reservoir and the parish engines were kept. The paper praised 'all classes' for their efforts in controlling the fire - ie gentry, tradesmen and 'the working men', together with the representatives of the various insurance offices: Sun, Phoenix, West of England, Farmers' etc. In particular J B Paige, R Tucker, R Caunter, R E Abraham, W A Cockey, W Barrows, Thos Lyle, J Tozer, J Hele, J Caunter jnr., and Rev W Marsh, jnr., were named, and praise was given 'to the young gentlemen of Ashburton Grammar School' some of whom stood in two feet of water with the working men' for over two hours. The fire focused the town's attention on preventing future calamities. The state of the bell rope obviously had to be addressed and it was suggested that public gas lamps should be lit, at a minimum of at least one per street on the darkest nights: at the time no lamps were lit between Lady Day and Michaelmas. The parish engines, which dated back to 1750 and 1786, had not been powerful enough, so it was also suggested that the Fire Insurance offices should contribute to a more powerful fire engine, with fire ladders and crooks - the same plea that Charles Worthy was making twenty years later. There should also be appointed, it was stated, 'an efficient brigade of active persons, resident in the town'. The 'Parish engine' in the Wilderness School museum in the 1930s was, according to the School Magazine, from about 1887 - see the Upbuilding of Character page under Greylands and the Wilderness Schools pages. 1889 Messrs Shand, Mason and Co.* of London, supplied a new fire escape to the town. 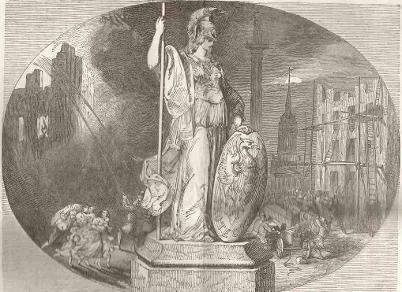 Captain Tucker and the fire brigade demonstrated it to a large number of people at the Bull Ring, firstly by putting it up on to the building of the Rose and Crown, and 'rescuing' Fireman Foot. Similar demonstrations were made at the premises of Mr W B Ward, Mr Distin and the Commercial Hotel. The event would prove to be a motivating force for the volunteers, as well as giving them the opportunity to see a remarkable young man, the heir apparent to the throne of England. In 1895 The Volunteer Fire Brigade were called out to St Lawrence Lane, but the fire was out on arrival. A porter from the Great Western Railway had left his pipe in his coat pocket, which had then set both the coat, and the door on which it hung, alight. 3 cottages at the higher end of North Street, on the banks of the river Yeo [now Ashburn] were destroyed in 1892. A spark from a nearby chimney ignited the thatch, and the houses were soon on fire: all the occupants* could do was to try and rescue their possessions. Captain Tucker and the fire brigade arrived quickly and prevented the fire spreading to other properties, and many people rendered assistance, 'conspicuous among whom were the women'. *'labouring men' Townsend, Pengilley and Mugridge. 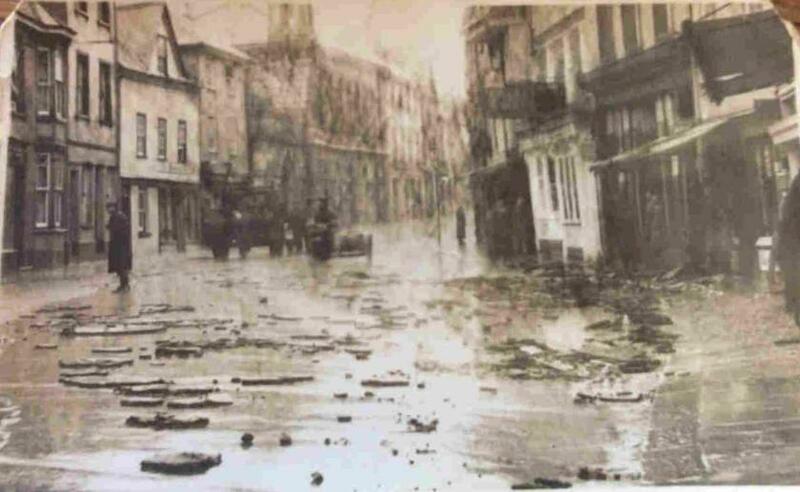 Mr Clymo's drapery shop in North Street caught fire in 1900. It was thought that the wind blew a piece of muslin or ribbon across a gas burner. Gas pipes burst and a large plate glass window cracked with the heat. The premises were insured. 1900 £60 worth of damage was done to Miss L and C C Soper's millinery business after a fire. The cause of the fire was not known. 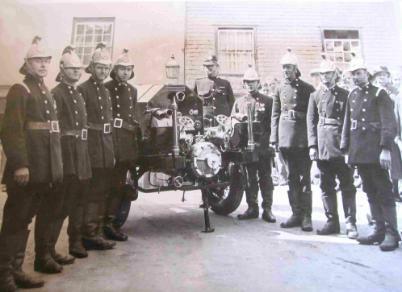 In 1902 the Volunteer Fire Brigade was based at Station Road. George C Foot was Captain, plus 7 men. This may have been the same George C Foot who was living in St. Lawrence Lane (an alternative name for Station Road) in the 1901 census. Aged 37, he was an auctioneer and land agent. 1908 saw a devastating fire in St Lawrence Lane in which John R Eddy, aged 80*, died. Richard Soper, captain of the Fire Brigade, with others attempted to rescue him, but were beaten back by the flames. The blaze threatened the adjoining buildings of the Post Office and Holly Cottage, but both were saved. A good supply of water was taken from the leat to Osmond's Mill. 1909 Captain R Soper, Ashburton Volunteer Fire Brigade, was one of the officials at the second annual prize competition of the Buckfastleigh Brigade. Sub-Captain J Reddaway was one of the timekeepers. Captain Reddaway was in charge of the brigade when there was a fire at Mr A Cove's property, Sunnyfield. Greenhouses and sheds were destroyed, together with tools and 'rare and valuable plants and vines'. The firemen, from left to right, are thought to be: Knowling*, B Tall, A Nickolls, A Steer, G Hext, Jim Warren, E Dann and J Bonstow. In 1937 a fire which started under a tar boiler damaged two engines and sheds at Mrs Lewis Rugg's quarry and tarmacadam works, Linhay Hill. J S Selley, the night watchman, discovered the fire, and he and the manager, Mr R J Bligh, threw sand and gravel over the fire, which was speading rapidly. Chief Officer Bonstow was in charge of the fire brigade, and together with police officers P S Wills and P C Beavis the fire was contained one and a half hours later. 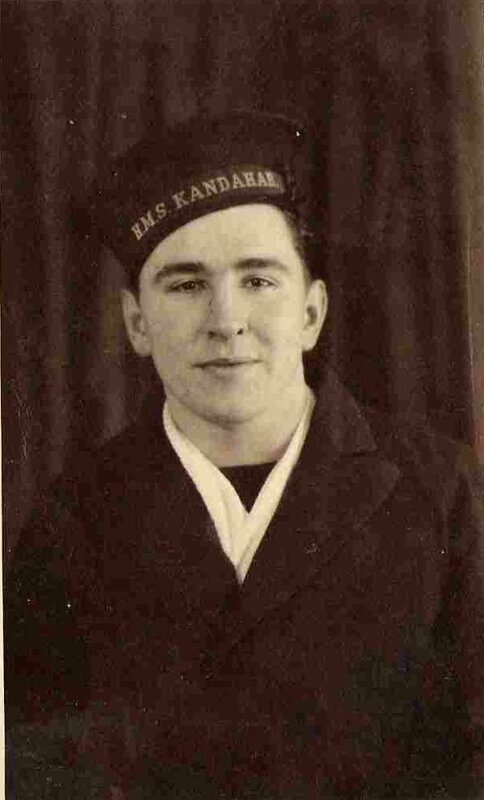 James French died in 1943. The bearers, members of the Fire Brigade, were: J Bonstow, W Tall, A Nicholls, F Baker, G Boorman, G German, G Endacott, G Mugridge. Above: The fire station, next building past the Golden Lion on the left. 'My father, Oliver Victor Brooks - known as Vic - was a member of the Ashburton Fire Brigade. The Brigade moved to East Street after the war, and was used in the film Guilt is My Shadow in 1949. He became Station Officer - contemporaries in 1954 were: Fred Baker, John Baker, Dougie Williams, Bill Sargeant, George Endacott, Fred Egbeare, George Mugridge, Jim Morrish and John Brixey. In 1958 Vic decided to leave Ashburton and return to his birth town of Windsor, where he also joined the Fire Brigade. Many thanks to Carol Scott nee Brooks for the above information. 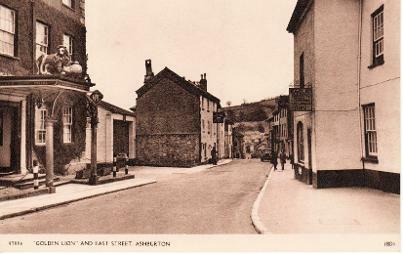 Flooding was a regular occurence in Ashburton until the flood prevention scheme in the 1970s alleviated the situation. In 1881 there was extensive flooding, the worst, said the Western Times, since 1852. 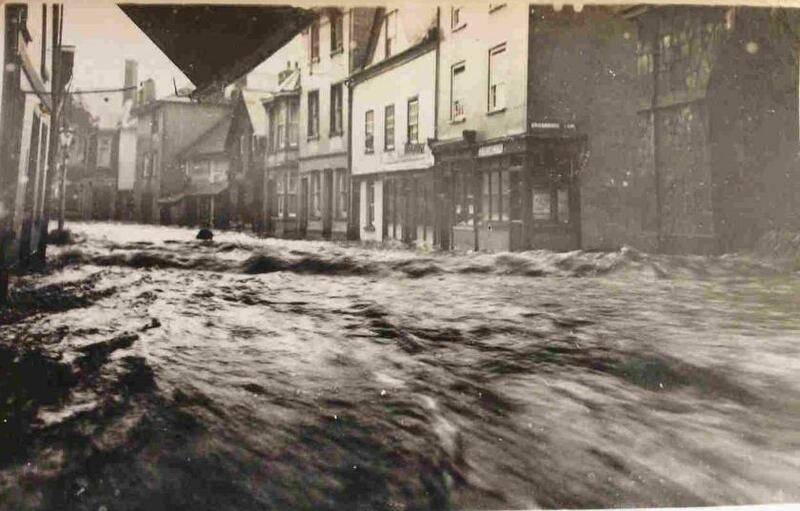 There was a flood from the Globe Hotel downwards, and West Street was impassable from Mr J Down's to the Wesleyan Chapel. The wool-sorters at Messrs Berry's, 'who should have breakfasted at 8.15' could not do so until ten o'clock. In the early 1930s the Urban District Council spent much of its time discussing the problem. 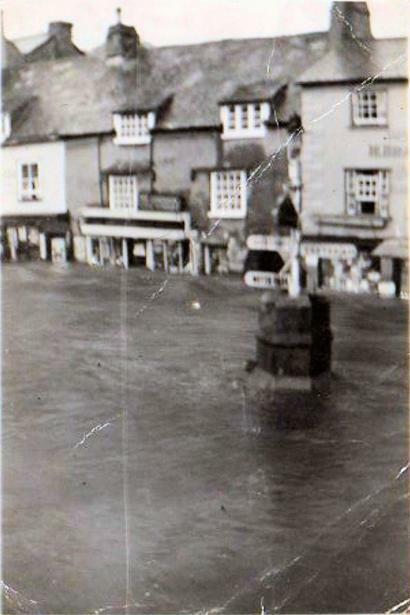 In the winter of 1932 the centre of the town was flooded over the weekend of the 9th and 10th of January: a grating in the mill stream and a blockage causing excess water to enter the River Yeo (now the Ashburn) were blamed. In August 1938 the Western Morning News devoted most of a page to a storm that hit the whole county, with the heading 'Westcountry arises from sea of ruin'. 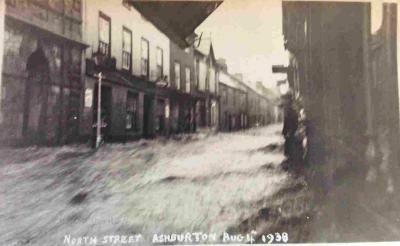 Shops in Ashburton were flooded out, 'with provisions floating in the streets'. Left: A flooded Bullring. On the back of this photograph is written in pen '1938' and then 'August'. Many thanks to David Dawson for this photograph and information. James Arscott and Eileen Martin told the following story about their relative, Russell Martin, born in 1921. The precise year in the 1930's is uncertain, although it seems likely that it was in 1938, the year of the 'sea of ruin'. 'Russell Martin, swam around the Bullring ........He and his best friend swam under the water, they collected packets of butter/ lard/cream etc. and smeared the contents all over the walls and doors of the shops under water. When the flood receded and everything dried out, the smell was horrendous. Russell and his friend were caught, taken somewhere public, bent over chairs and the Headmaster gave them both '6 of the best'. They were just 2 high spirited boys who got caught when a prank went wrong'. Many thanks to Frances Berry and Christine Lunt for this recollection. Circa 1936/38 was when he was in Navy Boy Service and about this time swam up North Street. Above, right and below: More photographs of floods. One is labelled Aug 4th 1938, and it is likely that the others are of the same date. 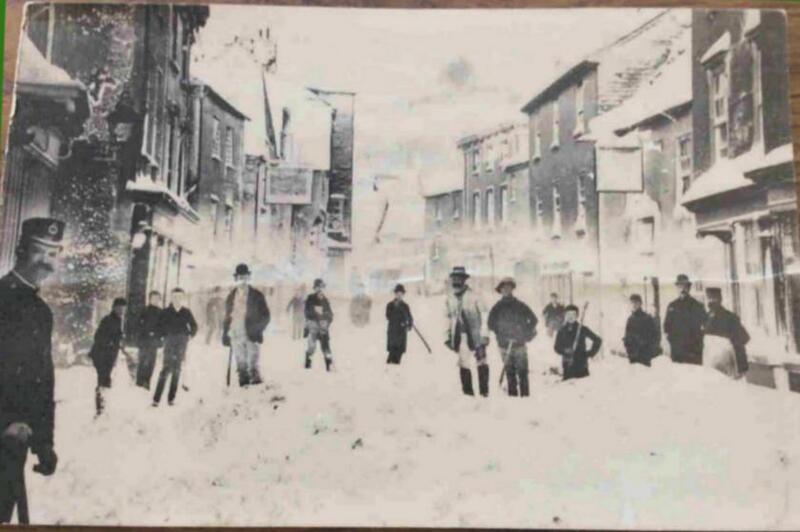 'The Blizzard in the West' is, in its own words, 'A Record and Story of the Disastrous Storm which Raged throughout Devon and Cornwall on the Night of March 9th, 1891.' A cold but calm day rapidly turned into a tempest, the wind, which reached Force 10, forcing the temperature down even further. Falls in barometers had been the only indication of changing conditions, leaving people unprepared, and flocks and herds unprotected. Snow had reached Plymouth by noon on Monday the 9th, but melted at first. However, as the wind began to rise the snow started to lay. Slates began blowing off roofs, chimneys collapsed and advertisement hoarding were blown down. Traffic stopped in the streets, and trees were uprooted; iron seats were blown from their fastenings on Plymouth Hoe. Ashburton experienced huge drifts - one at Holne Turn was a quarter of a mile long and between 8 and 20 feet high - most roads were blocked. Bakers were unable to get their supplies out to their country customers. By the end of the week business was more or less back to normal, but there had been a serious loss of stock. The apple orchards fared badly, with some younger trees losing every branch. The Blizzard in the West, no author named, London and Devonport, undated, p83. Above and below left: Snow in Ashburton in more recent times. 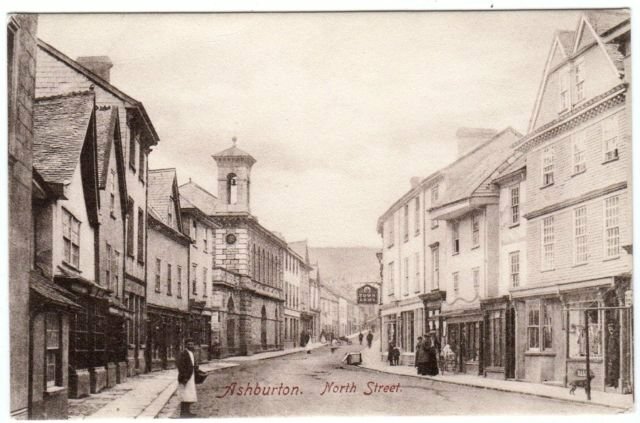 Snow was not uncommon: 12 inches of snow fell at Ashburton the following February, with deep drifts stopping the traffic. The mail cart from Newton Abbot was 2 hours late. Villages were cut off by snow at the beginning of 1939 - mail vans from Newton Abbot could not reach a large number of places. There were four foot drifts between Ashburton and Tavistock. There were four foot drifts between Ashburton and Tavistock. By the end of January 1947 householders in the South West were warned to conserve supplies of food, as snow was preventing deliveries.Some snowdrifts were nearly ten feet deep, and 'scores' of Widecombe farmers and others were working to try and open the road from Widecombe to Ashburton. There were still many miles to go. The winter of 1963 was the coldest for 200 years. A belt of snow that began over Scotland at Christmas reached southern England on Boxing day, and there was a blizzard over the southwest on the 29th and 30th of December. Above: The old vicarage, now (2016) St Andrews House Residential Care Home.